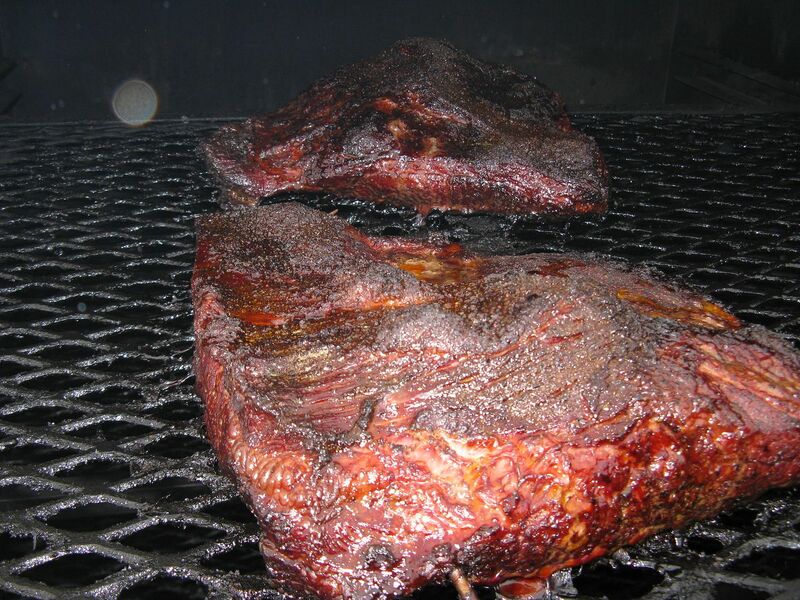 Our last post focused on the Hot and Fast method of smoking a brisket. This method seems to be all the rage these days on the BBQ circuit. 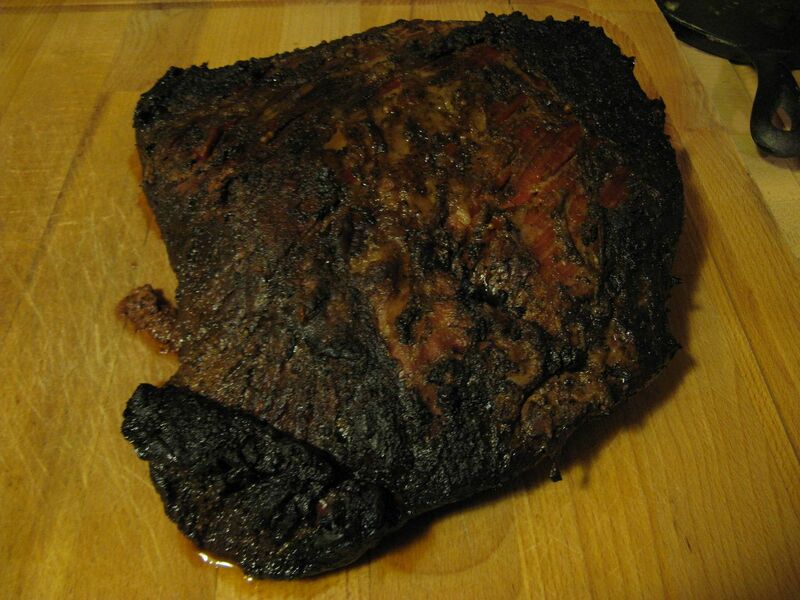 But, now I go back to a method where I made my best brisket, from a tenderness standpoint: going Low and Slow. Twelve years ago for a house warming party (I've lived here this long? Where does time go?) I smoked a nice brisket on my Weber kettle. It took all day long, but it was tender. So, lets see how low and slow works on a proper smoker. 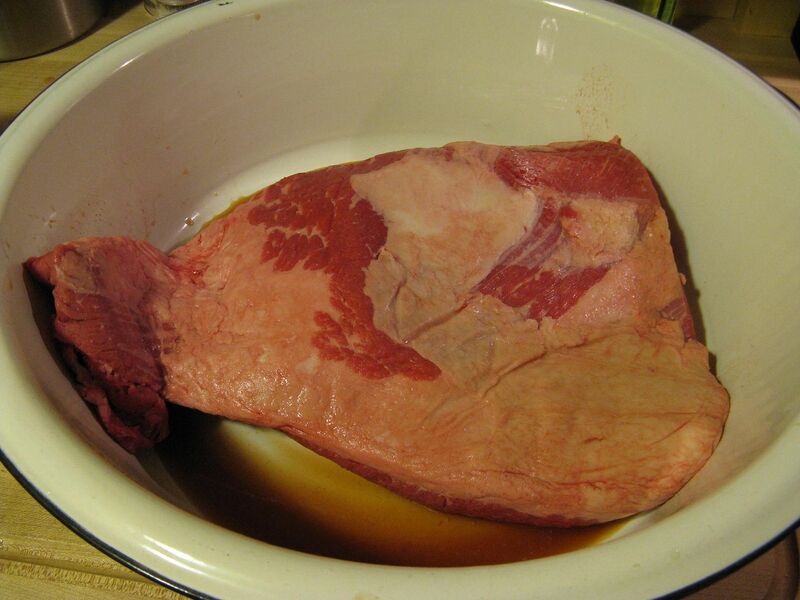 This time I had some advance notice as this brisket was for a Super Bowl party. So, I had a full seven pound flat and a seven pound point. 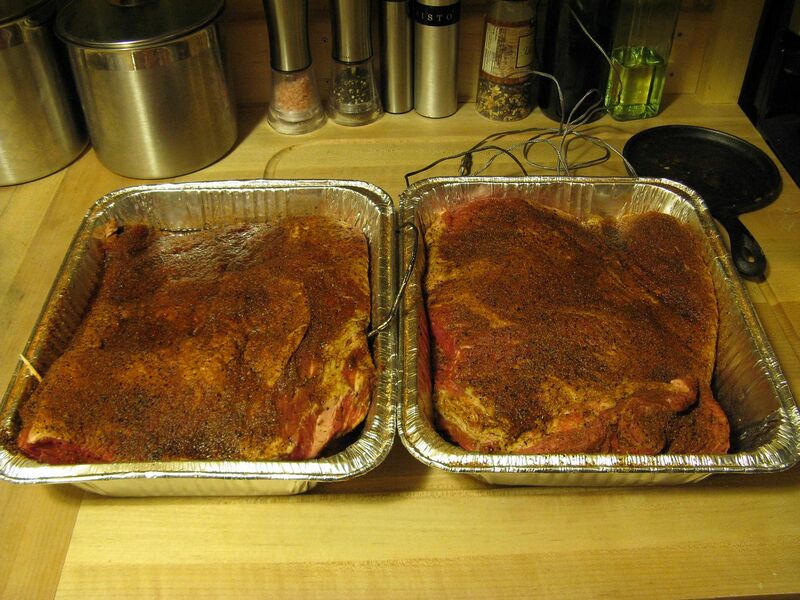 I injected both, rubbed liberally with Oakridge Black Ops Brisket rub, and let sit in the refrigerator overnight. Placed brisket on top rack in the middle at 6:45 am. 12:10 pm, flat at 159 F internal. 2:24 pm, flat at 171 F internal. 2:45 pm, flat at 175 F, time to put in pan with reserved injection and cover with foil. 5:30 pm, point and flat at 195 F. Probe slides in like butter. Time to pull and rest. I wrapped both pans with towels and let sit in a cooler for two hours to rest. 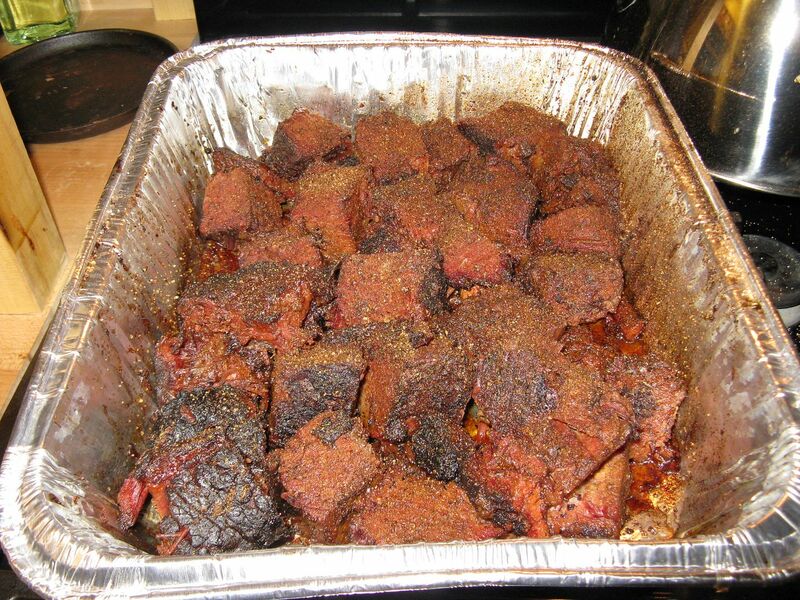 Then, I made burnt ends with the point and sliced the flat. Here are the results. This brisket now ranks as the best brisket that I have ever made. 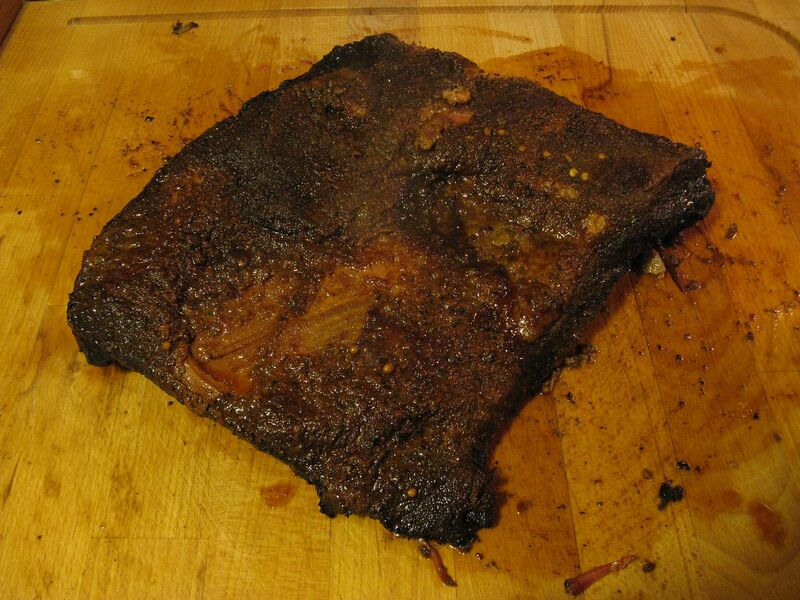 It was also the first brisket I have made that was ready at 195 F. This brisket was tender and full of flavor. 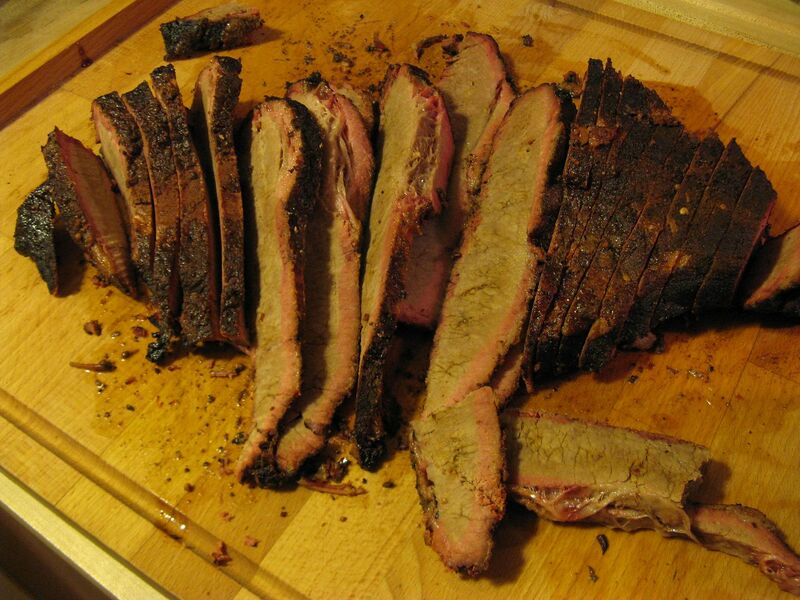 It would have not scored less than an eight in any category on the KCBS judging scale. What do I think of the two methods? Well, every brisket is different. 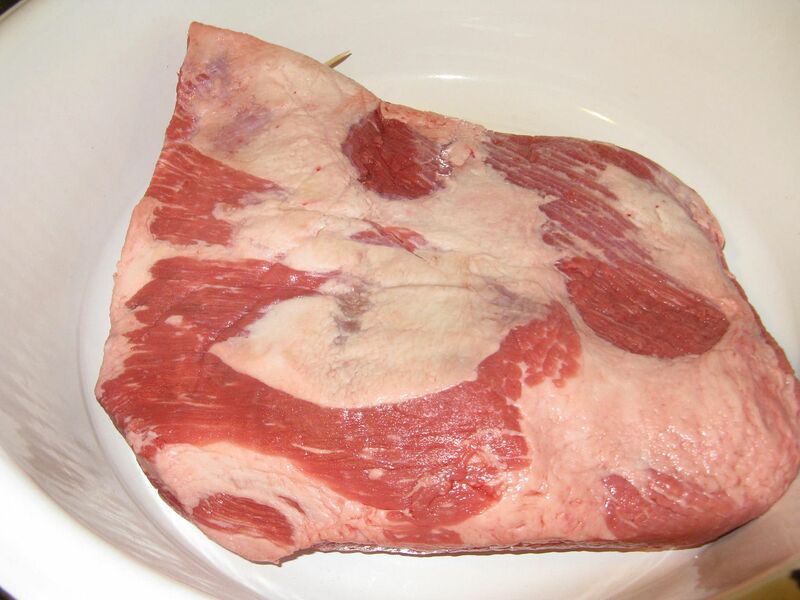 I could have been lucky that the Low and Slow produced a brisket that was perfect from a tenderness standpoint at 195 F. I usually end up probing until the meat reaches between 200 and 205 F. So, I will try this method one more time before May. But, I am leaning towards low and slow. It may mean less sleep for me at a competition. But, it may pay off the next day with a walk to the stage. Overall, I was glad I tried both methods. If I need to produce a brisket on short notice, the Hot and Fast method will produce acceptable product in a short amount of time. If I am looking for the gold standard, Low and Slow is the way to go. You have raised some interesting questions. Low and slow or hot and fast? There are a lot of variables. 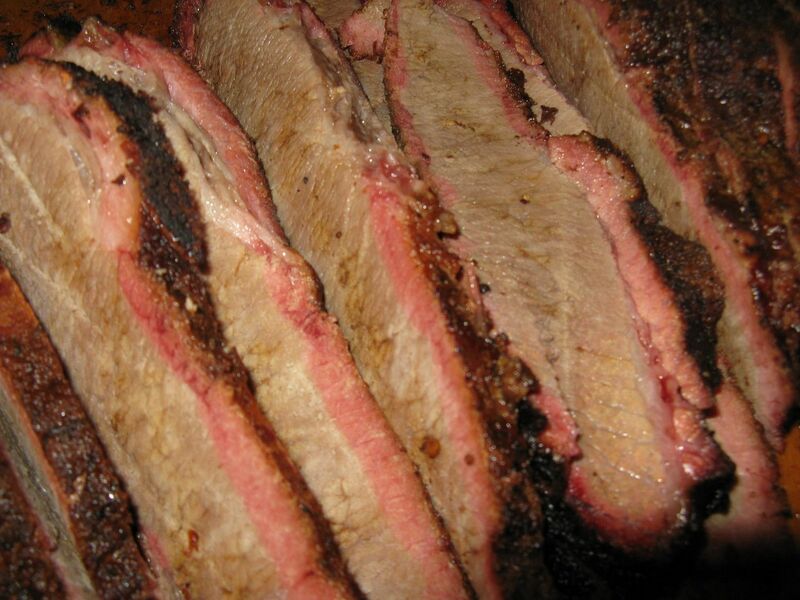 It seems like such a waste when a whole brisket is cooked for the few perfect entry slices. I was a little aghast about your comment on proper smokers. Granted the Weber kettle's main use is grilling but with my Smokenator 1000 or just proper heat control the Weber kettle smokes just fine. I guess you can tell I am a Weber fan. I picked up some ribs from a pig farmer at the farmers market today. The Weber Smoky Mountain cooker will be in action tomorrow. We try not to waste any of our food. A few of the contests we enter collect leftovers for the local soup kitchen. Otherwise, they get bagged and brought home for the oldest to circle like a vulture. As for my proper smoker comment, you have to remember I used to use a cheap odd set bought at a big box store. Leaked like a sieve. I like smoking on my Weber still. Good product. I would consider the Smokey Mountain a proper smoker. I just see my kettle as more of a grill.